"This is one of my family's favorites. 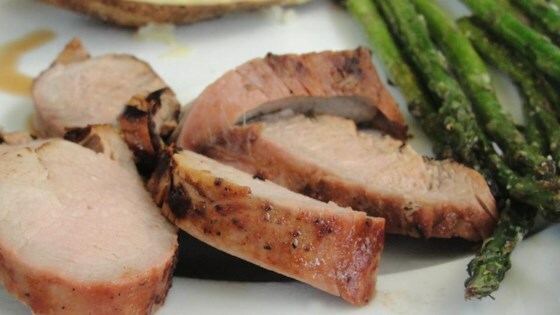 This pork recipe is always tender and juicy. Serve with additional barbeque sauce for dipping." Brush tenderloin with barbeque sauce. Continue cooking for 15 minutes, or until an instant-read thermometer inserted into the center reads 145 degrees F (63 degrees C). Allow pork to rest for 10 minutes. Slice pork, and serve with additional barbeque sauce for dipping. "Cook over indirect heat for 30 minutes."???? How do you do this on a grill? Wow, great and easy! I baked mine at 350 for 45 minutes, added the bbq sauce, and then baked for another 15 minutes at 325. Came out perfect, moist, and delicious! This recipe was fantastic! I rubbed the tenderloin with olive oil before I sprinkled it with the spices, and turned it often on the grill. My parents and I all LOVED it! I really like this recipe. It's easy and quick. I put the meat on a greased toaster-oven pan over a charcoal barbecue. It was indeed tender and yummy.